March 20, 2018, 11:37 AM · British violinist Daniel Hope has been named music director of the San Francisco-based New Century Chamber Orchestra, replacing Nadja Salerno-Sonnenberg, who stepped down in 2017. "The connection I felt with each and every member of this fine orchestra was immediate from the first moment we played together," Hope said in a statement. Daniel Hope. Photo by Nicolas Zonvi. Hope, 44, had been appointed to serve as "Artistic Partner" of New Century for three seasons starting last fall, but he was officially named "Music Director" in an announcement Friday from the stage, following a joint performance with the Zurich Chamber Orchestra. His five-year contract with New Century runs through the 2022-23 season. Hope also serves as Music Director in Zurich, a contract which was recently extended through 2022. Like Salerno-Sonnenberg, Hope conducts the group primarily from the concertmaster chair. "We are delighted to welcome Daniel Hope as a permanent member of the New Century family," founding board President Paula Gambs said in a statement. "The impact that he has had on the entire organization in such a short space of time has been astonishing." 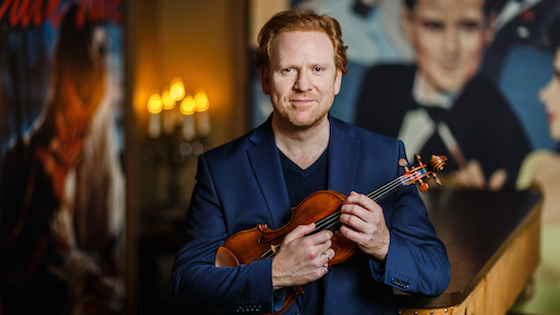 Born in South Africa and raised in London, Daniel Hope's career is wide ranging: violin soloist and recording artist, conductor, writer and producer. Among his recordings are For Seasons (2017); My Tribute to Yehudi Menuhin (2016); Recomposed By Max Richter (2012). March 21, 2018 at 06:49 PM · My greatest congratulations. He is a great violinist and many times not well recognized BRAVISSIMO!!! !